Houzz has unique insights into how people are designing their homes. Vertical surfaces are set to be a new design frontier in homes. From walls to island benches, we will continue to see a more creative approach to these facings. On Houzz, we've seen half-round oak dowels used to great effect on island bench fronts, shiplap cladding used in exciting new ways, and wool utilised as a wall covering. Expect to see new technological surfaces make their mark next year too; at Cersaie 2018 in Italy, a range of 3D textures imprinted on tiles and new surfaces such as Kerlite – a thin, laminated porcelain reinforced with fibreglass - made a strong appearance. Confirming what we thought, professionals on Houzz are seeing an increased demand for pastel-coloured kitchen cabinets, which is set to strengthen next year. Millennial pink made major inroads into decor in 2018, opening the way for other pastel-based hues, including baby blues, green washes and soft greys. These are proving to be a safe way to express colour in the kitchen, and in 2019 and beyond, are likely to rival all-white kitchens in popularity. In 2019, we'll continue to embrace our love for the outdoors as the look of exterior furniture moves closer to that of interior furniture. We saw this in the Houzz AU Landscape trends study, with 46% of renovating homeowners creating comfortable spaces through outdoor dining furniture. Webbed detailing, slinged-back chairs and turned legs on tables will be embraced by the fashion-forward. 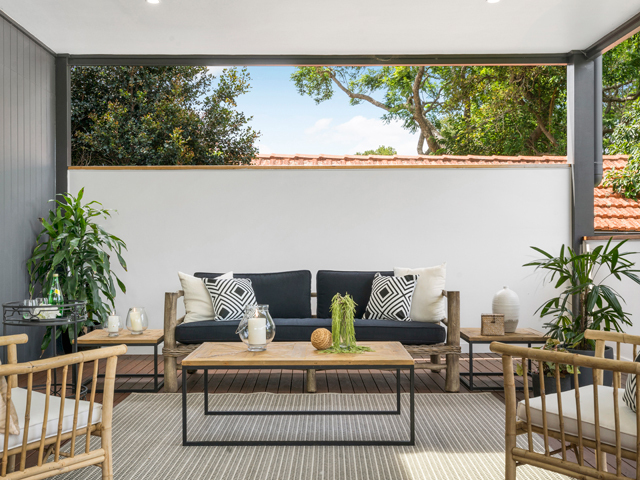 Those who desire relaxed outdoor living are likely to forgo large dining settings and instead turn over their space to living room-like arrangements by choosing roomy modular sofas with accompanying coffee tables and statement armchairs. Timber-clad pods have been popular as a way to add a separate backyard room, granny flat, teenage retreat, or studio for the past few years. Now, we are seeing on Houzz that pod-like shapes are attached to, or inside homes. In this Sydney extension, the pod houses a laundry and bathroom and sits, in a deliberately ambiguous way, between the interior and the deck. We suspect rounded pods will continue to pop-up in the centre of otherwise conventional spaces and rooms. The desire for physical wellness and mental wellbeing will increasingly be expressed via soothing palettes that soften our environment and give us the measure of serenity we seek. Muted, chalky hues will grow in popularity with greens - from mint to sage - leading the charge, backed up by watermelon, subdued apricot and soft tans. We also predict matt finishes will continue to rule the roost in 2019. We are seeing architects, building and interior designers on Houzz utilising every inch of space in the home, be it under-stair areas, voids, end of joinery gaps, alcoves, even below-ceiling space, by integrating deliberate features into these forgotten areas. And, in their design approach, they are calling attention to these secondary areas rather than allowing them to recede into the background. 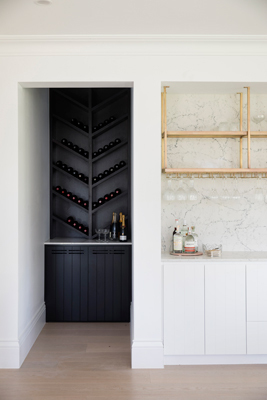 Think alcoves turned into wine storage, under-stair areas becoming play spaces for children, display elements in disused areas, functional joinery built into narrow spaces and corners transformed into eye-catching studies.